GOP Presidential candidate Herman Cain is enjoying his days of glory and basking in his victorious poll numbers. In an article in today's Hot Air, the headline read, "Oh my, Cain 30, Romney 22, Gingrich 15, Perry 14." Although Cain beats Romney with the Tea Party crowd, one must take into consideration that Romney is a formidable candidate because he has the kind of money to run a long campaign that Cain simply does not have. Rick Perry does have sufficient funds to continue in the race, but other candidates will soon begin to drop out. Presently the votes are split among all the candidates. Until they begin to consolidate between two or three of the front runners, it will be difficult to tell who will be the Republican candidate who faces Barack Obama in the 2012 Presidential election. Pollsters and pundits are crunching numbers and giving the statistics their best shot, but no one has a crystal ball that can tell them for certain who Obama's opponent will be. In August of this year, Rolling Stone Magazine ran a story in which they announced that the Obama campaign was targeting "weird Romney" by planning to launch a "ferocious personal assault on Mitt Romney's character and business background." At the time, Obama's popularity was still in the positive column and in spite of the fact that most Americans felt that his administration was leading the country in the wrong direction. The conjectures of the Rolling Stones political writers back then included considering Rick Perry's stance on immigration, and the only other candidates who were then considered as contenders were Michelle Bachman, Tim Pawlenty and Ron Paul. Today's front runner Herman Cain was not even included in the article. It is obvious that in August of 2011, no one could predict that Obama's popularity would plummet as it has, and that his policies, ideas, and solutions to get the country back to work and the economy to recover would be met with such failure. Obviously the Obama team's attempt to discredit Romney met with little success this past summer. After Tuesday night's New Hampshire GOP Presidential debate, it became obvious to many that Mitt Romney could probably the GOP Candidate who would take on Obama in 2012. Most observers feel that there is plenty of time for the Republican field to narrow and for others to emerge stronger than Romney. The ability to debate doesn't necessarily indicate a candidate’s ability to govern. The amount of money a candidate raises goes a long way to buying ads and exposing new ideas to the voters. To judge a candidate on the basis of a debate performance as many journalists and analysts are doing, is somewhat simpleminded. No one can explain his/her position on a subject in a limited amount of time. It is premature to decide that one candidate will definitely be the nominee. For those of us who want to see Barack Obama lose his bid for reelection it is somewhat encouraging to see Axelrod focus on Romney, especially since he is not our first choice. 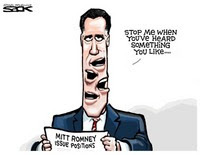 We too agree that Mitt Romney has repeatedly changed his position on very important issues a number of times, and there are videos and quotes to substantiate the charges. However, we won't reveal those topics here as we'd rather give our candidate the opportunity to bring them the attention of the American voters. Perhaps the Obama camp will have more success discrediting the ever optimistic; deep pocketed Romney, than he did back in August when they attempted the same strategy. Eventually, it is our opinion that the Republican Party will win the 2012 race, regardless of who the nominee may be.